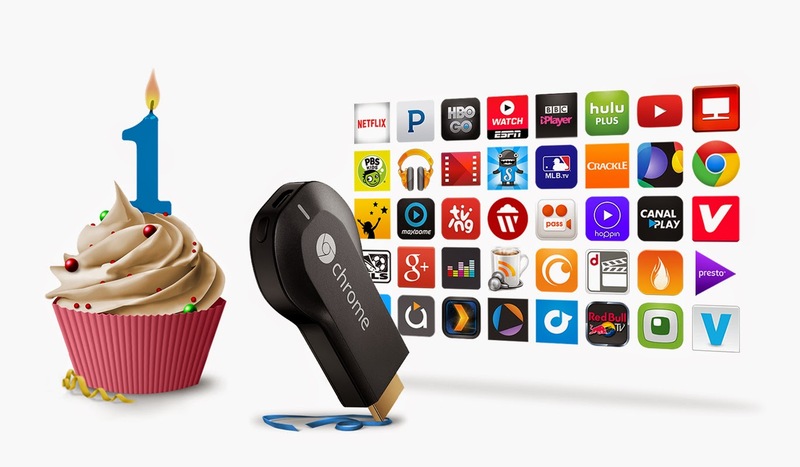 Google Chrome Blog: Happy 1st Birthday, Chromecast! , celebrates a year. We built Chromecast to make it easier for people to enjoy their favorite entertainment from their phone, tablet or laptop on the largest screen in the house—the TV. 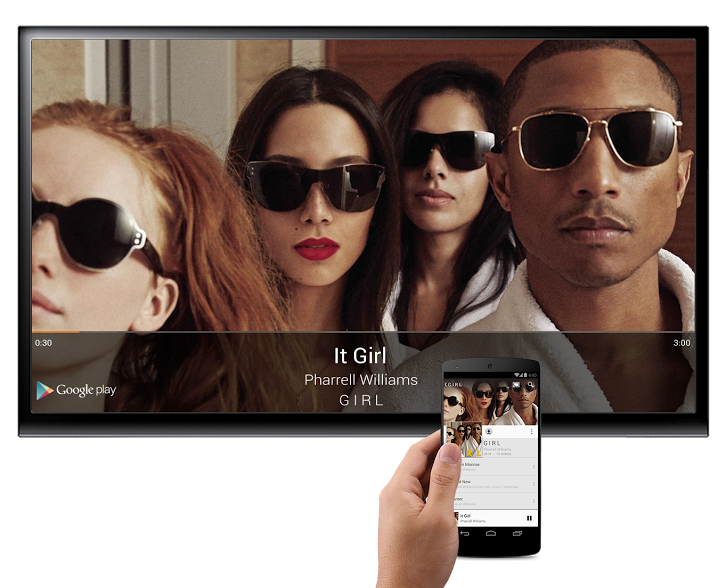 Since Chromecast launched, people have hit the cast button more than 400 million times to enjoy their favorite sports, music, premium movies and TV shows. We’ve added hundreds of your favorite apps, including WatchESPN, Pandora, Hulu Plus, HBO GO and PBS Kids; announced new features like mirroring your Android device to the TV and expanded to 30,000 stores across 20 countries. To celebrate Chromecast’s birthday, Google Play Music is offering All Access subscriptions free for 90 days to anyone with a Chromecast (and who isn’t already an All Access subscriber). This offer will be available in the U.S. starting today, July 24, 2014 through September 30, 2014. If you already have a Chromecast, go to chromecast.com/offers to redeem this offer. Visit the Help Center to learn more. Whether you’re hosting a dinner party or cleaning up around the house, enjoy your favorite summer hits from Google Play Music, Songza or Pandora on your TV. Create a video playlist from the YouTube app and cast it to the TV. Friends can add videos to the queue, so you’ll always have another one on deck. No more figuring out old-fashioned projectors or huddling around the phone. Cast your photos from your Android phone or tablet so everyone can enjoy those beautiful pics from your camping trip in Yosemite or your sister’s wedding in Hawaii. Tune in to live sports with MLB.TV Premium and MLS Live on Chromecast. And come fall, you can invite your buddies over, pass around the popcorn bowl, and watch college football or NFL’s Monday Night Football with the WatchESPN app on the living room TV. With apps like Daily Burn on the rise, it’s easier than ever to work out at home. But can you really do downward-facing dog while holding your tablet? Cast your workout so you can truly get a good morning sweat session in. We’re not done yet. In the coming months, we’ll be making more updates, like the ability to allow others to cast to your TV without needing to be on the same WiFi network, and a customizable homescreen with personal photos or beautiful art. Your Chromecast will be automatically updated with these new features once they’re available. Happy birthday, Chromecast. Here’s to another great year ahead! Today our little one, Chromecast, celebrates a year. We built Chromecast to make it easier for people to enjoy their favorite entertainment from their phone, tablet or laptop on the largest screen in the house—the TV. Since Chromecast launched, people have hit the cast button more than 400 million times to enjoy their favorite sports, music, premium movies and TV shows. We’ve added hundreds of your favorite apps, including WatchESPN, Pandora, Hulu Plus, HBO GO and PBS Kids; announced new features like mirroring your Android device to the TV and expanded to 30,000 stores across 20 countries.